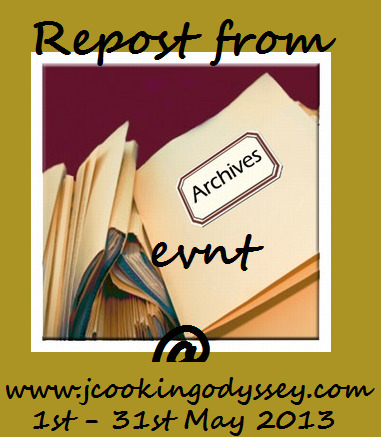 Jagruti's Cooking Odyssey: Event Announcement - Re Post from Archives !! There is always a time probably once a year when you sit down and look at all of your old family photos whilst you reminisce in the "good old days". We can also watch home videos - there are so many means by remembering what happened a long time ago. This thought gave me an idea for my next event. Some of us have been blogging for a while whilst others may have just started! Why not repost some of our old posts from our blog for newer readers who probably haven’t seen them and older readers who may have forgotten but would enjoy reading again?! Interested? Then read below for the details! How to Repost your blog post. Go to DESIGN (top right of your screen). Click POST SETTINGS and choose Schedule. Change to AUTOMATIC and then PUBLISH POST. This post should now be at the top of your feed. The previous comments are still there too. Only entries allowed are posted between in month of MAY 2010, 2011 1nd 2013. Go ahead and send your delicious recipes and also check out our other events too. My Bowl of Salad and Food, She Loved I loathed ! One more brain child of yours ! Hats off to your ideas for event hosting..
have linked my recipe....but this one i posted in may 2013. is it fine? let me know..